The Arts Media Contacts press database covers the visual and performing arts and music. The result of 20 years research, it lists all the media outlets, critics and correspondents who cover the arts in national, regional and international press. As well as full contact details including direct telephone, email and social media, each entry offers a paragraph of information about the publication or programme with advice on how to get your event featured. The database is constantly updated and each entry is checked at least every four months. get reminders for media deadlines. 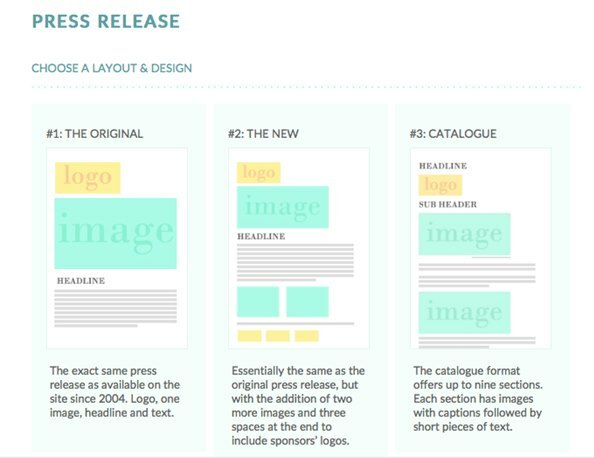 create press material using templates. email press releases to one or many journalists. share event information on social media. follow-up mailings with direct contact and record the response. 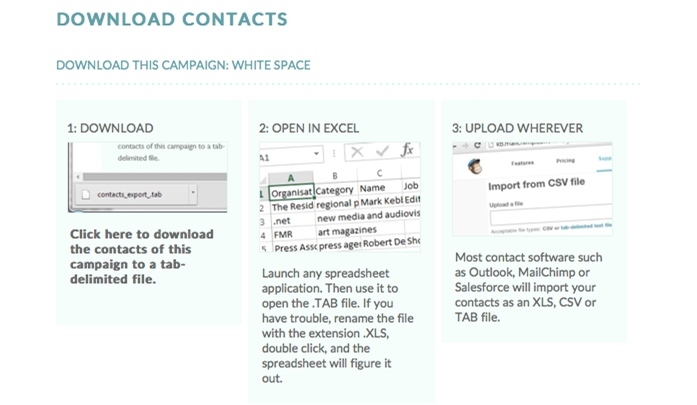 download our contacts or upload your own contacts. 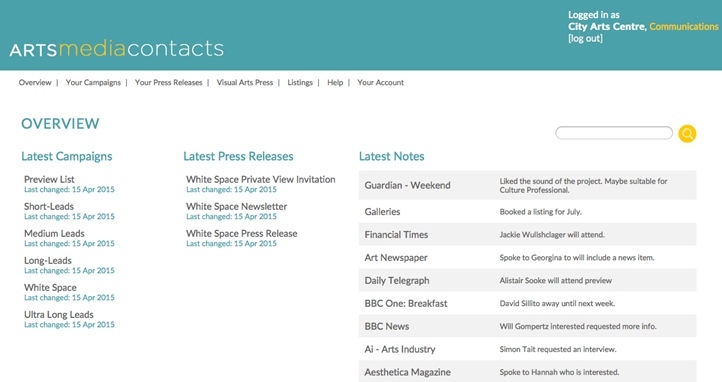 Arts Media Contacts is used by press or communications officers at leading arts institutions and venues, arts officers in local government, art colleges, commercial galleries, arts publishers, festivals, theatres, arts centres, music, dance and theatre companies. What do you want to achieve with Arts Media Contacts? 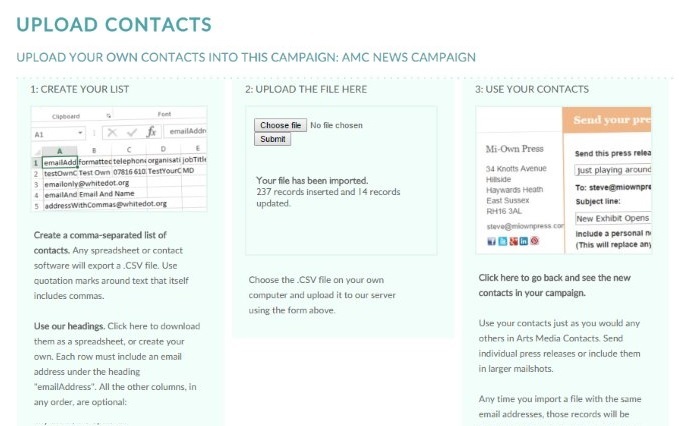 "Arts Media Contacts is a vibrant, constantly evolving tool that delivers results. I use it in conjunction with my personal contacts and the mix creates a wide reaching net which pulls in some big fish." "We started using Arts Media Contacts at the beginning of the year and already we have seen an increase in media response to our press releases - The program helps us plan our campaigns better and target our media pieces for full benefit." 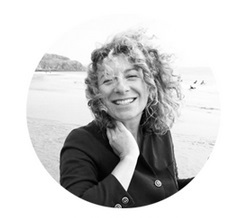 "I'm thrilled with the program and happy to recommend it." 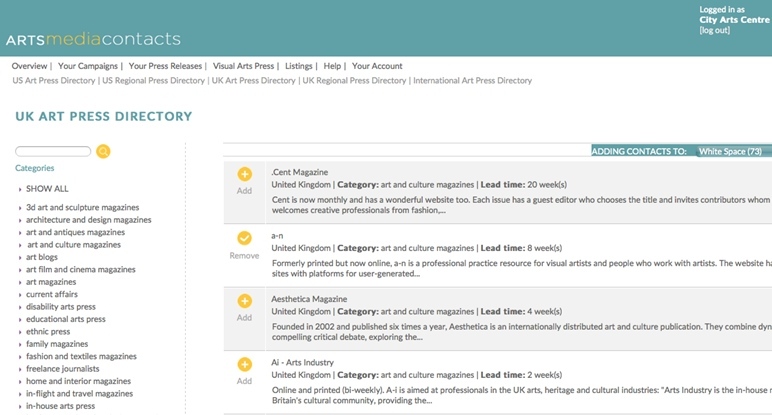 "The one stop source of media information for the arts industry." "An invaluable aid to a press campaign." 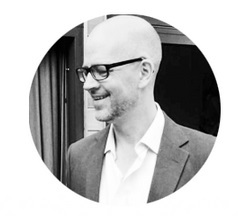 "An incredible source of contacts in the art industry. It is, at Envie d'Art our Bible!" "What would I do without Arts Media Contacts? I have been with them for five years and am totally happy with their service. 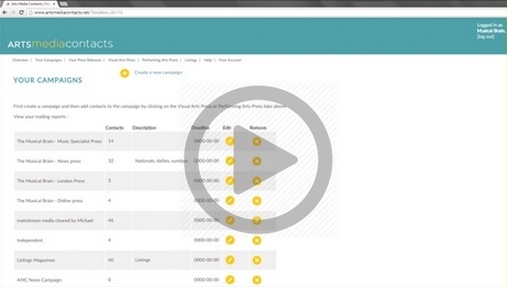 Their directories provide an efficient, straightforward way to keep up to date with the ever changing world of media. 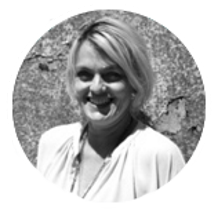 Through them I can send tailored press releases directly to the most current journalists and publications." 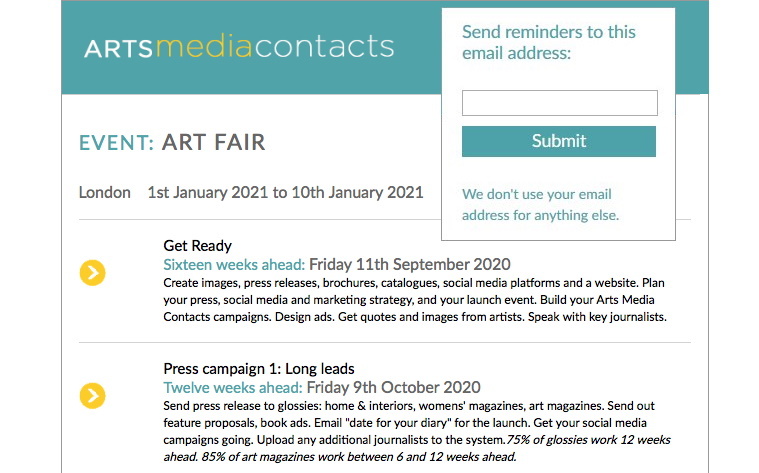 Arts Media Contacts is published in the UK by Arts Media Contacts Ltd.
Arts Media Contacts was set up in 1995 as a collaboration between leading arts journalists and press officers. The founding principle is that the journalists receive a stream of press releases on relevant arts events in time for their deadlines, and that arts organisations get good media coverage for their events. 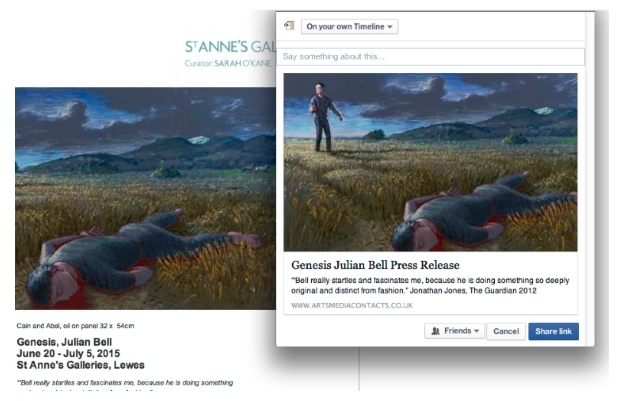 Published by Arts Media Contacts Ltd. The data we supply on Arts Media Contacts is GDPR compliant. Under the ‘Legitimate Interest’ clause you are able to contact restricted types of businesses without direct consent if you have a product or service which may be of interest to them. We supply press releases about future arts events to art media businesses who have seen and agreed to their entries. Any personal data held by us is by opt-in consent only. We make every effort to ensure that our data is up-to-date, accurate and valid. All our messages have an unsubscribe option which we adhere to.